The new year starts with a wealth of promises, in fact, with concrete orders in the superyacht sector that is growing not only in countries that traditionally covet yachts, but in emerging countries like China, India etc.. The interest shown by numerous countries for this product that leaves a trail of wealth, is vast. Many have, therefore, hurried to enact regulations for super-yachts when they are being chartered. Most of them aspire to the English Coast Guard's MCA, a must for gaining access to certain exclusive marinas. All the manufacturers and certification bodies would, however, prefer an international law, valid at least in Europe and North America, that would provide both owners and masters with complete peace of mind in handling their yachts. Who offers more? In the sense of tax, insurance and welfare breaks? The Republic of San Marino with its important, fully legitimate flag, that sees the sea from above, is seriously considering how to use this to its maximum potential. How long will this phenomenon last? From reports that are periodically published, the number of very rich people in the world is growing exponentially. Even if only a small number of them are interested in super-yachts, there is work for everyone for decades to come and more. And the proof of this lies in the success of our International edition that is sought after almost all over the world. This is why we have decided to increase our issues from four monthly to quarterly. 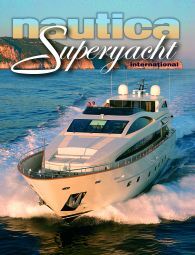 Even the Italian edition, as we all know, attached to "Nautica" magazine, will be published quarterly: winter, spring, summer and autumn. As far as credit card subscriptions for the English version are concerned, we will deal with readers' needs at our web site. But even the Fort Lauderdale Boat Show, that went ahead a week late as a result of the disasters caused by Cyclone Wilma, confirmed that the appeal of large boats is very much alive. There were not the same numbers as in past years but those who went were highly motivated and numerous deals were sealed. And the success of European boats is undoubtedly linked to the valuation of the dollar against the euro. At the moment it is only a trend but if it continues, it will open up excellent prospects for those adhering to the single currency towards the US market and countries dealing in dollars. But another aspect of the market was highlighted at the "Marketing in the Nautical World and Yachting Satisfaction" conference held in Rome in November by Sergio Cherubini, professor of Marketing at the Faculty of Economics in the University of Tor Vergata. The president of the Fraser Yacht, Carlo Agliardi, explained how the large boat market has changed and the present evolution in the brokerage sector that has been ongoing for some time, now requires a complex of initiatives and services. Not only do we no longer wait for the clients to turn up, but we are one step ahead of them, eliminating any doubts they may have before, during and after their purchase that might see their dream of owning a boat fade. The broker is no longer, as was the case in the past, simply a go-between, between buyer and seller, but a company operating at 360§, from financing to dealing with all the papers, from the search for a captain and crew to finding a mooring, to the right boatyard for carrying out repair and restructuring work to supplies of all kinds of goods, services and provisions.